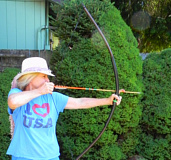 Archery safety is extremely important for anyone who shoots a bow and arrow! I realize that might be a no brainer but please don't under estimate the power of a bow and arrow. Many people every year are injured in the sport of archery. You need to be aware of what these safety issues are and practice safety when using any type of bow and arrows. BW Bows and Arrows wants to do our part in educating our customers and the public regarding what to do and not do regarding all aspects of archery. We want you to know that we take every pre-caution possible when building our bows. We want you to have fun and feel safe when you purchase one of our bows. First, we make sure the material we use to make a bow is not in anyway damaged. However, we test every bow we make but shooting it, testing the limps to make sure they will not fold or break. We make sure the strings are secure and undamaged. The bows we make are regarded as a primitive because we use no backing of any kind. We make our bows from Polyvinyl chloride, more correctly but unusually poly(vinyl chloride), commonly abbreviated pvc, is the third-most widely produced synthetic plastic polymer, after polyethylene and polypropylene. This is a high tech way to make great self bow or primitive bows. We make great bows that have stood the test of time. We are in our 3rd year of production, 5 online stores and as far as we know, we are the largest maker of pvc bows in the world. Now, we could be wrong but I do believe I am right. I am going to provide you with a few links that can help you learn Archery Safety. THINK SAFETY AT ALL TIMES - YOUR BOW IS NOT A TOY! Make sure you are always thinking safety. Simple things can make a big difference. Don't point the bow loaded with an arrow at anyone. Make sure minors, young people have an adult with them at all times. Our goal at BW Bows and Arrows is to provide a safe bow for you to experience the sport of archery. REMEMBER BE SAFE!